We’ve all heard the story a million times, and a million different ways. 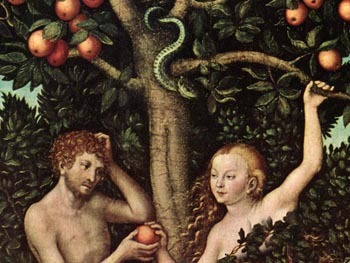 Was it Eve’s fault for our eternal demise, or Adam’s? Was it both of their faults, or was it neither? I’d like to believe that neither Adam or Eve were at fault. That Eve’s heart was in the right place, just not her head. You see, when the serpent tempted Eve, he didn’t tempt her with glory or riches. He tempted her with the desire to be LIKE God. If it were me, who got to spend all this precious time with our loving and wonderful Heavenly Father, I too would admire him so deeply that I’d do anything to mirror Him. I don’t believe Eve’s heart was ever to disobey God, or to exalt herself above him, she simply wanted to be like Him. Don’t we all find ourselves wishing we could understand things the way God does? The hard times in life would be a whole lot easier if we could only understand why we had to face the hard times in the first place. But of course only the all-knowing can truly be all knowing. I love how the story of Adam and Eve paints a picture of how God responds to our mistakes when we try to understand things on our own, or when we go our own way. From the very beginning God has always looked for those who are lost. Adam and Eve hid from God out of shame, but God came searching. So many times I’ve heard this said as if God was angry, and yelling. But, think of it as a concerned mother who has just lost her kid in the store, “Honey, where are you?” Think about the relief she feels when she finds her son. That was God here, searching for His loves, and relieved when he found them. So while yes Eve made a mistake, God came looking, and He made a way for us to be with Him again. I love that we serve a God, that from the very beginning, showed us there will always be a way to be with Him. I love that we serve a God who sees our hearts, and not just our sins. Arrianna is a happy-go-lucky young lady who enjoys spreading the love of Jesus through: fashion, youtube, and writing. One day she hopes to be a wife, mother, and friend, but most importantly, a world changer for the Kingdom of God. To read more about Arrianna, click here. Great post. Beautiful reminder of the God we serve. Even in our mistakes He is faithful to come looking for us. We are never alone.